You know that feeling you get when you watch a really great tv show? The one where you feel like you know all the characters as if they were real people in your life. The one that when the episode ends you feel lost and unsure of what you’ll do to keep yourself from obsessing until the next episode. Yeah. I get that. Really really really bad. When I decided to get caught up on Rookie Blue, I watched every episode from the first three seasons in less than a week. And then, because there was no new episode for the fourth season that week, I watched them all over again. And if you think that’s bad, let me just tell you that I’m just as bad or worst when it comes to books. Yep. I am a reader. Seriously, its probably the best way to wind down before bedtime, unless you’re like me, and get so into a book that you decide to put off sleep as long as possible, which could easily mean 3 or 4am on a work night. I read the complete Twilight Saga less than two weeks. During that time I hardly slept or ate. I lived for the free moments in my day when could pick up the book again. Lunch hours, yeah, they weren’t used for eating. And dinner definitely didn’t happen until I was so hungry my stomach couldn’t take it anymore. And it was amazing. I loved it. I picked it up, and didn’t put it down until I was done. Not joking. I had heard it was great, but I had no idea how true it was. My only complaint is that no one warned me about the tears that would inevitably be streaming down my face. 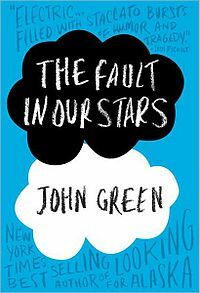 Everything in this book: the characters, the story, the words, they all have the power to be an inspiration. If you haven’t read it, I suggest to take the chance. Like any other book, there’s the possibility for it to be a hit or a miss. Perhaps you’ll love it, perhaps it just won’t be your kind of book. If its a miss, then you’ll say its not worth the hype. But if its a hit, man, it hits hard. I could go into a lot of detail about why this book was a major hit for me, but to do that I’d have to use some major spoilers, and I’d hate to ruin even a little bit of it for any of you. Because you should read it. You really really should. Regardless of whether or not its a hit or miss for you, you’ll undoubtedly take something wonderful away from it. Its just that kind of book. So go buy it, right now. P.S. Once you’ve read the book, you’ll understand the title of this post.